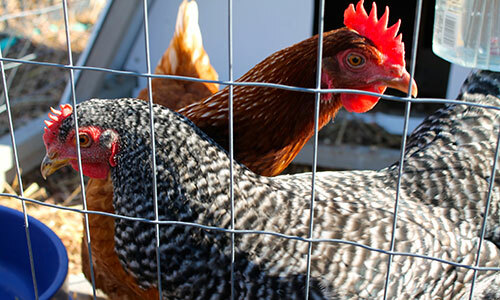 Our new Fillmore Early Childhood Center is in full swing now, and we’ve added a “farm” component: organic vegetable gardens that were built and planted this fall, and on December 4, our hens arrived with a chicken coop. Our two beautiful hens are already laying eggs, and the children gather the eggs, feed the chickens, and help maintain the coop. 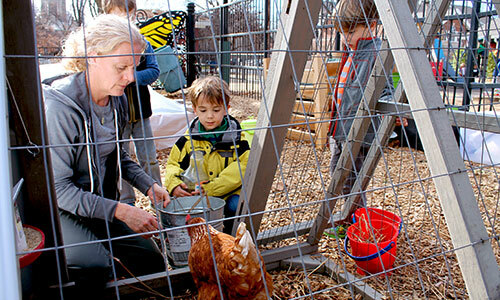 Counting, cooking, and eating eggs with fresh garden vegetables will help children understand and experience firsthand the food chain and how we are connected. 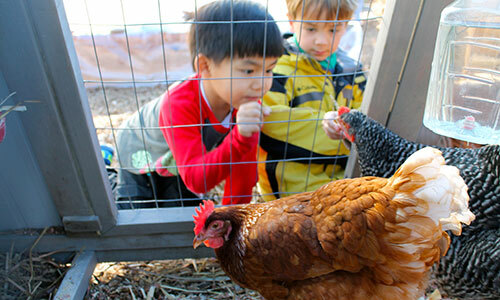 With guidance and hands-on help from their teachers, the Junior-K children serve as “farmhands,” an opportunity that teaches them about caring for the chickens. 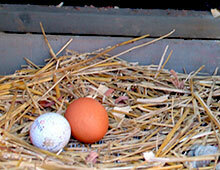 The hens have a laying box in the hen house part of their coop, and there’s a golf ball in the nest to encourage laying. After cleaning the coop and refreshing food and water, the farmhands and teachers open the rear entrance to the coop to check for eggs. There, next to the golf ball, is a beautiful brown egg that is carefully scooped up and placed in the egg basket, ready to be taken inside and added to the collection. When a dozen eggs have been collected, the children are going to make omelets with Mrs. Duffy. See more photos. Take a look in the Fillmore Butterfly Garden. You’ll see the chicken coop with Sunny, the black and white Barred Rock, and Rosie, the red Easter Egger, named by the Junior-K children. They are captivating.